When my husband requested a Boiled Dinner (corn beef, cabbage, etc.) 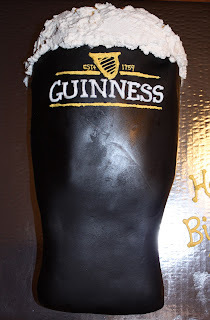 for his birthday meal, I knew the perfect pint cake to compliment it. This pint of Guinness is marble cake with half chocolate buttercream and half vanilla buttercream. It's decorated with fondant and buttercream. Happy Birthday to the best husband and father I know, we hope you liked your "beard" cake (as our 3.5 year old called it)!